As you know the Detroit Tigers have been, for lack a better word, streaky. 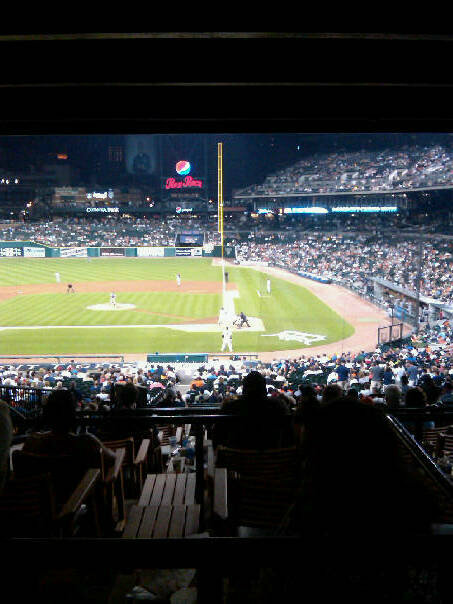 This past week, they played at Comerica Park (which is good), against the Baltimore Orioles and the Minnesota Twins. The Orioles series was particulary exciting for me. I was able to make it to three of the four games, and the Tigers took three of four from the Birds. The weekend series against Minnesota had its surprises. Most notably, the Twins aquistion of Carl Pavano from the Indians. Detroit faced him on Saturday night, and were shut out. But, they were able to put another notch in the win column on Friday, and again this afternoon. Today’s win, in nearly 95 degree temperatures, was big. In addition to the long ball (Thames and Cabrera), the Tigers played small ball, and showed an ability to manufacture runs when they were needed. The drawback in today’s game was Jarrod Wasburn’s inabilty to prevent his opponents from reaching base, and scoring. In his second game as a Detroit Tiger, he pitched six innings and gave up 10 hits, and five earned runs. Today’s win went to Brandon Lyon. Fernando Rodney (with no lack of drama), picked up his 23rd save. Tomorrow night, the Tigers will be in Boston. Edwin Jackson (8-5 2.62 ERA)will pitch for Detroit. Former Los Angeles Dodger pitcher, Brad Penny (7-6 5.20 ERA)is on the mound for the Red Sox. This entry was posted in Dailies and tagged Baltimore Orioles, Brad Penny, Detroit Tigers, Edwin Jackson, Jarrod Washburn, Marcus Thames, Miguel Cabrera, Minnesota Twins. Bookmark the permalink. The Tigers put up a great fight last night but I think my Red Sox were very hungry for a win!